If you start seeing a ” Your Subscription Expired” message on your Fyers One Trading Terminal. Do not Panic. 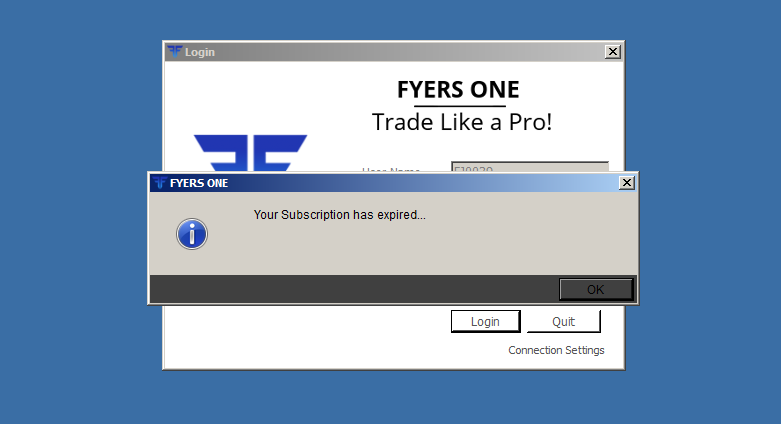 The message shows up when you try to login to the Fyers One Desktop Platform. Many traders try to reset their trading password after seeing this message. However, This does not resolve the issue. Reactivating your Fyers One Trading Terminal validity. The Solution is to ring the Fyers Brokerage Customer Service on 080 4625 1111 and request to reactivate your Fyers One Terminal subscription. There is no charge for re activating your Fyers One Trading Terminal Subscription. After you ring them up. it takes about 5 minutes before you can re-login to your Fyers One Terminal Successfully again. This entry was posted in Fyers One and tagged fyers, fyers one. Bookmark the permalink. ← Open HIGH LOW Scanner On FataFat Stock Screener.